uncertain, but will you, O God, watch over each step of mine and guide me. Although there are times when all of these may appropriately occur within Spiritual Direction. The “guide” listening carefully to the pilgrim reflecting prayerfully on on his/her life. In this process both pilgrim and guide seek to pay attention to the presence of God in the pilgrims’ life. Both are “co-discerners” - noticing the ways in which the pilgrim responds to God ant the ways s/he resists God. Both are concerned to nurture the life of God in the pilgrim and to encourage the expression of this life in ordinary and practical living. The ministry of Spiritual Direction provides a safe and welcoming place to take seriously our growing relationship with God—to be encouraged in this and to become more intentional in it. This is arranged by you and the Director. The time between visits varies—an average would be around once a month. Spiritual Direction is usually a long term process—a thoughtful reflection on you faith journey. Ordinary everyday people like you! These are people with the gifts needed for this ministry and who have spent time in training and study in this area. They are also pilgrims, and are engaged in receiving Spiritual Direction themselves. Sr. Lorraine Testa (asjm) is a member of the Australian Network for Spiritual Direction Inc.
With extensive experience in the area of Catholic education and faith formation, her ministry reaches out to facilitating retreats/reflection days for individuals or groups. She is also available for Spiritual Direction . 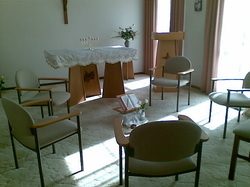 Contact Sr.Lorraine to arrange an appropriate time to discuss Spiritual Direction, retreat days/reflection days.